To Cite: Yaghoubi F, Yarmohamadi M. Oxalate Nephropathy Causing Irreversible Renal Failure After Roux-en-Y Gastric Bypass Surgery, Nephro-Urol Mon. Online ahead of Print ; 11(1):e80757. doi: 10.5812/numonthly.80757. Introduction: Oxalate nephropathy after RYGB, albeit rare, has a poor prognosis with a rapid progression to kidney failure. Oxalate nephropathy has many etiologies and is one of the rare causes of renal failure. Case Presentation: A 39-year-old diabetic woman came to our nephrology clinic because of a progressive increase in serum creatinine from 1 to 4.2. She had a history of Roux-en-Y gastric bypass (RYGB) surgery six months earlier. In view of the unexplained progressive increase in creatinine, a kidney biopsy was done. The histological diagnosis of oxalate nephropathy with diabetic nephropathy class 2b was made. Conclusions: Oxalate nephropathy is a rare and most severe renal complication after bariatric surgery that is reported in some patients after jejunoileal bypass and RYGB surgery. Oxalate nephropathy is progressive in nature and has a poor prognosis. In our case, oxalate nephropathy and kidney failure occurred six months after RYGB surgery. Since the histological finding in our patient revealed oxalate nephropathy with diabetic nephropathy class 2b, it seems diabetic nephropathy can probably facilitate calcium oxalate crystals formation. This important point should be considered that oxalate nephropathy could rapidly progress to renal failure; so, patients who undergo Roux-en-Y gastric bypass surgery should have regular follow-ups. Despite the rare cases of oxalate nephropathy following Roux-en-Y gastric bypass (RYGB) surgery, it is usually associated with a poor prognosis and rapid kidney failure progression (1). Oxalate nephropathy as a rare cause of kidney failure has many etiologies. In this disease, calcium oxalate crystals are deposited in tubules leading to tubular injury, interstitial fibrosis, and severe progressive renal insufficiency. A 39-year-old diabetic woman was referred to our hospital because of increased serum creatinine. She complained of nausea, dizziness, and malaise for two months. She lacked diarrhea, steatorrhoea, fever, and urinary tract symptoms and did not take any nephrotoxic drug. She has been suffering from diabetes mellitus since 15 years ago, diabetic retinopathy and neuropathy for five years and renal stone for two months, along with a history of Roux-en-Y gastric bypass (RYGB) surgery for morbid obesity since six months ago and two episodes of cesarean. After RYGB surgery, she had a weight loss of more than 30 kg and a significant improvement in blood glucose level. There was no prior renal disease. At the time of the bypass surgery, the serum creatinine level of the patient was 1 mg/dL. According to the patient’s record, she did not have a family history of kidney disease. Furthermore, her vital signs were stable with an unremarkable clinical examination. The laboratory investigation showed normocytic normochromic anemia with a hemoglobin level of 7.5 g/dL, renal insufficiency with serum blood urea nitrogen of 33 mg/dL, and creatinine level of 4.2 mg/dL. Urinalysis revealed a pH of 5, specific gravity of 1.025, and 6 - 8 white cells/hpf without any casts, proteinuria, or hematuria. A 24-h urine collection revealed hypocalciuria and uric acid within the normal range. Immunological tests were negative so that Anti GBM, Anti dsDNA, AncA-MP, and AncA PR3 antibodies complement levels were within the normal range. The ultrasound examination of the kidneys showed their normal size without any evidence of obstruction. The Renal Artery Doppler Ultrasound was normal. Computed tomography of the abdomen and pelvis was also normal. Kidney biopsy was performed due to an unusual increase in the creatinine level without a known reason. Eighteen glomeruli were observed by the histological examination of the biopsy specimen under light microscopy. Of these, two were globally scleroses and the rest showed histologically segmental thickening, hypercellularity, and mesangial matrix expansion. Interstitial infiltration of chronic inflammatory cells was observed with severe interstitial fibrosis and tubular atrophy in more than 50% of the specimens and intratubular calcium oxalate crystals in the lumen of some tubules (Figure 1). 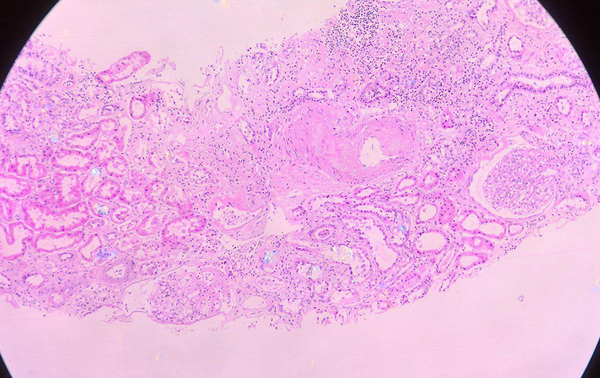 Arteriolar hyalinosis was evident under polarized light with calcium oxalate crystals in tubules (Figure 2) leading to the histological diagnosis of oxalate nephropathy with diabetic nephropathy class 2b. Figure 1. Kidney biopsy under light microscopy using hematoxylin and eosin staining: glomeruli appeared normal whereas the interstitium showed moderate edema, fibrosis, and multifocal lymphoplasmacytic infiltration. Some tubular epithelial cells showed degeneration and loss of nuclei with intraluminal acellular deposits. The immunofluorescence showed a nonspecific immune reaction compatible with diabetic nephropathy. Despite medical management of hyperoxaluria, her acute kidney injury worsened and no recovery of renal function was observed. Therefore, the patient is currently undergoing regular hemodialysis. The global prevalence of severe obesity is increasing. Severe obesity is associated with many kidney complications such as kidney stones and advanced kidney failure. Due to persistent weight loss following bariatric surgery, it is known as a good solution for obesity (1). Bariatric surgery is also effective in improving hypertension control, diabetes, albuminuria, dyslipidemia, and progression of chronic renal failure (CRF) (2-4). There are reports of reduced mortality and morbidity after bariatric surgery (5). The common type of bariatric surgery, called Roux-en-Y gastric bypass (RYGB) (6), is associated with nephrolithiasis and hyperoxaluria. Oxalate nephropathy is a seemingly rare but under-recognized complication. In a case study, 60 patients were evaluated after RYGB surgery. Among them, two patients only progressed to oxalate nephropathy (7). With the growing rate of RYGB surgeries (8), the incidence of oxalate nephropathy has also increased. This progressive disease carries a poor prognosis (9) with progression to ESRD within three months in 72.7% of the patients (10). Elevated free fatty acids bind to calcium in the intestinal lumen in fat malabsorption/enteric hyperoxaluria inhibiting the formation of calcium oxalate. Consequently, increased soluble free oxalate in intestinal lumen is absorbed by colonic mucosa. The absorbed oxalate is excreted by the kidney and then deposited in the renal parenchyma, forming kidney stones (11). Oxalate nephropathy may occur following surgery, inflammatory bowel disease, and poisoning by ethylene glycol (1). The most common clinical presentations include nephrolithiasis, nephrocalcinosis, progressive chronic kidney disease, and end-stage kidney disease (11). The most severe renal complication after bariatric surgery is oxalate nephropathy as reported in some patients after jejunoileal bypass and RYGB surgery. Nelson et al. (12) reported the first hyperoxaluria case in patients after RYGB surgery. In a case series, 11 patients with oxalate nephropathy after RYGB were reported. Kidney failure was observed after four to 96 months of surgery so that most patients progressed to severe kidney failure (10). Given the presence of oxalate crystals deposits in renal tubules with inflammation in kidney biopsy, it is known as the main diagnostic method for oxalate nephropathy (13). Oxalate nephropathy is described by the presence of calcium oxalate crystals in tubules that can lead to acute and chronic tubular inflammation (10). Oxalate nephropathy can be treated by low-fat and low-oxalate diet, high-fluid intake, and citric salts such as potassium citrate. Considering that calcium salts are bounded with oxalate, it can be an effective step, but there are a few studies on the efficacy of this approach. Cholestyramine may reduce the absorption of oxalate from the colon (14). The results of a case study showed that laparoscopic reversal of RYGB could improve hyperoxaluria and AKI within one month (urine oxalate level of 20 mg/day). If medical therapies fail to reduce hyperoxaluria, RYGB reversal would be considered in patients with progressive loss of renal function. However, it is unclear whether reversal of RYGB can improve long-term outcomes (13). Despite renal injuries in bariatric surgery, it may improve long-term kidney outcomes. However, its benefits and disadvantages should be first thoroughly evaluated (1). In our case, oxalate nephropathy and kidney failure occurred six months after RYGB surgery. Our case is a patient with AKI and a history of RYGB who needed to be evaluated for oxalate nephropathy and nephrolithiasis. In a study conducted by Nasr et al., 11 patients with oxalate nephropathy after RYGB were considered. Of these, nine patients were diabetics and seven patients suffered from diabetic glomerulosclerosis. Their results suggested that a history of the renal disease might provide an environment for the formation of calcium oxalate crystal and tubulointerstitial injury (10). The histological examination of renal biopsy in our case revealed oxalate nephropathy with diabetic nephropathy class 2b. It seems that diabetic nephropathy may provide an environment for the formation of calcium oxalate crystal. Therefore, long-term follow-up of metabolic parameters and renal function by changing diet or even surgical reversal in the early stages may be beneficial, especially in cases with pre-existing renal diseases such as diabetes (10). In this case report, available data on serum and urine oxalate levels were incomplete and we were unable to obtain detailed dietary information. Oxalate nephropathy is a rare and poor prognosis complication of RYGB. In patients with an acute or chronic renal injury with unknown causes and history of RYGB, a renal biopsy should be considered for a definitive diagnosis. Oxalate nephropathy can be rapidly progressed to renal failure. Therefore, patients undergoing Roux-en-Y gastric bypass (RYGB) surgery should be regularly followed up. 1. Chang AR, Grams ME, Navaneethan SD. Bariatric surgery and kidney-related outcomes. Kidney Int Rep. 2017;2(2):261-70. doi: 10.1016/j.ekir.2017.01.010. [PubMed: 28439568]. [PubMed Central: PMC5399773]. 2. Navaneethan SD, Kelly KR, Sabbagh F, Schauer PR, Kirwan JP, Kashyap SR. Urinary albumin excretion, HMW adiponectin, and insulin sensitivity in type 2 diabetic patients undergoing bariatric surgery. Obes Surg. 2010;20(3):308-15. doi: 10.1007/s11695-009-0026-1. [PubMed: 20217955]. [PubMed Central: PMC2891346]. 3. Shah SS, Todkar JS, Shah PS, Cummings DE. Diabetes remission and reduced cardiovascular risk after gastric bypass in Asian Indians with body mass index <35 kg/m(2). Surg Obes Relat Dis. 2010;6(4):332-8. doi: 10.1016/j.soard.2009.08.009. [PubMed: 19846351]. [PubMed Central: PMC2888958]. 4. Navaneethan SD, Yehnert H. Bariatric surgery and progression of chronic kidney disease. Surg Obes Relat Dis. 2009;5(6):662-5. doi: 10.1016/j.soard.2009.01.006. [PubMed: 19359221]. 5. Sjostrom L, Narbro K, Sjostrom CD, Karason K, Larsson B, Wedel H, et al. Effects of bariatric surgery on mortality in Swedish obese subjects. N Engl J Med. 2007;357(8):741-52. doi: 10.1056/NEJMoa066254. [PubMed: 17715408]. 6. Nguyen NT, Silver M, Robinson M, Needleman B, Hartley G, Cooney R, et al. Result of a national audit of bariatric surgery performed at academic centers: A 2004 university health system consortium benchmarking project. Arch Surg. 2006;141(5):445-9. discussion 449-50. doi: 10.1001/archsurg.141.5.445. [PubMed: 16702515]. 7. Sinha MK, Collazo-Clavell ML, Rule A, Milliner DS, Nelson W, Sarr MG, et al. Hyperoxaluric nephrolithiasis is a complication of Roux-en-Y gastric bypass surgery. Kidney Int. 2007;72(1):100-7. doi: 10.1038/sj.ki.5002194. [PubMed: 17377509]. 8. Shinogle JA, Owings MF, Kozak LJ. Gastric bypass as treatment for obesity: Trends, characteristics, and complications. Obes Res. 2005;13(12):2202-9. doi: 10.1038/oby.2005.273. [PubMed: 16421356]. 9. Nagaraju SP, Gupta A, McCormick B. Oxalate nephropathy: An important cause of renal failure after bariatric surgery. Indian J Nephrol. 2013;23(4):316-8. doi: 10.4103/0971-4065.114493. [PubMed: 23960354]. [PubMed Central: PMC3741982]. 10. Nasr SH, D'Agati VD, Said SM, Stokes MB, Largoza MV, Radhakrishnan J, et al. Oxalate nephropathy complicating Roux-en-Y Gastric Bypass: An underrecognized cause of irreversible renal failure. Clin J Am Soc Nephrol. 2008;3(6):1676-83. doi: 10.2215/CJN.02940608. [PubMed: 18701613]. [PubMed Central: PMC2572276]. 11. Chou CW, Teng CJ, Hwang WL. 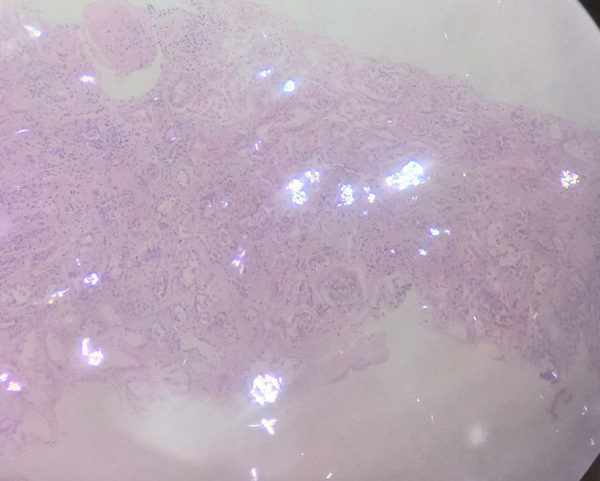 Oxalate nephropathy related end-stage renal disease in a gallbladder cancer patient after Roux-en-Y surgery. J Cancer Res Pract. 2016;3(3):94-5. doi: 10.1016/j.jcrpr.2016.05.005. 12. Nelson WK, Houghton SG, Milliner DS, Lieske JC, Sarr MG. Enteric hyperoxaluria, nephrolithiasis, and oxalate nephropathy: Potentially serious and unappreciated complications of Roux-en-Y gastric bypass. Surg Obes Relat Dis. 2005;1(5):481-5. doi: 10.1016/j.soard.2005.07.002. [PubMed: 16925274]. 13. Agrawal V, Wilfong JB, Rich CE, Gibson P C. Reversal of gastric bypass resolves hyperoxaluria and improves oxalate nephropathy secondary to Roux-en-Y gastric bypass. Case Rep Nephrol Dialysis. 2016;6(3):114-9. doi: 10.1159/000449128. 14. Verdelho M, Mendes M, Ribeiro F. Oxalate nephropathy following Roux en Y gastric bypass surgery: Mini review. Port J Nephrol Hypert. 2016;30(3).